Heating Capacity: Up to 1,600 sq.ft. Beautifully styled as well as extremely energy-efficient, the Slayton 36 is a linear gas fireplace that provides a superb design accent to any room. Direct venting and a compact size make it the perfect choice for any residence. 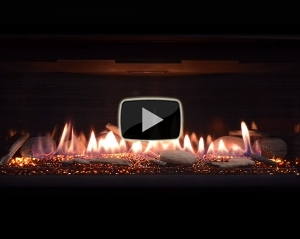 If you’re looking for a modern fireplace that adds appeal wherever it’s located, the Slayton 36 is a great option. This fireplace benefits from 33,000 BTU/hr input for the Natural Gas model and 33,000 BTU/hr input when liquid petroleum is used. Burning efficiency is impressive. The Natural Gas option operates at 68.80%; the LP Gas operates at 71.96% efficiency. Canada P-4 approved and relatively economical to operate, this fireplace is an environmentally responsible choice. The Slayton 36 offers many cutting-edge features that allow it to offer outstanding performance and value. The flame, light, fan, and thermostat can all be controlled remotely, and the fireplace incorporates lifetime glass and quick latch technology. A high-low regulator and high-caliber burner system are further features of this premium product. This fireplace can be customized to meet your individual requirements, with a range of different design features. If you need a high-grade fireplace that’s attractive, easy to operate, and cost-effective to maintain, the Slayton 36 could be the perfect choice.